If you live in a home where closet space is at a minimum it can be frustrating trying to keep clothes stored free of wrinkles. It can also lead to annoying clutter, with clothes strewn throughout your home, making getting dressed a nightmare and creating a stressful, messy living environment. The beauty of living in a country with changing seasons is that you have different clothes for the season. This not only allows you to buy more fun fashions but also allows you to store away your summer and fall clothes until the hopeful signs of spring arrive. If space is at a premium, a self-storage unit is a great solution for storing your unneeded clothes. Use these tips to help protect your clothes from damage. What better time to rid yourself of some of those unsightly clothes you no longer wear than when packing them up for the season. Sort through everything and look for clothes that no longer fit, or that you haven’t worn in a year. This will cut down on the number of things you have to pack and unpack. You can donate your unwanted items or sell them online. People love vintage, a charming name for stuff someone else didn’t want any more. Once you’ve downsized your summer and fall wardrobe it’s time to wash everything. First and foremost, treat and wash any stains, as the longer they remain on your clothes the harder it will be to remove them. Use a spot remover and thoroughly wash anything that needs washing. When drying clothes, avoid using strongly scented dryer sheets as these will actually attract pests to your units. Make sure your clothes are dried completely as moisture will allow mould and mildew to grow, ruining your clothes. First, sort everything based on the type of clothing putting all your sundresses in one pile, your blouses in another, etc. Keep lighter fabrics and clothing on the top of any piles you create. Look through pockets of your clothes and coats and remove anything you find. Lay down your clothes and fasten your buttons, zippers and snaps. Fold everything neatly and then place them in the containers or boxes you are using. When storing clothes, it is always best to choose plastic bins. This will allow your clothes to breathe and avoid moisture build up. If you can afford garment bags, they are your best choice as they are specifically designed for breathability. Remember, although plastic bins work, plastic bags do not. They can maintain moisture and also make white clothes turn yellow. To deal with things such as bulky sweaters, avoid using vacuum-style plastic bags. Although these are an excellent option in the short term, or for items such as linens, they will crush the fibres of your sweaters and make it difficult for them to return to their fluffy cozy self once freed from their bag. Loosely folding clothes is always best for long-term storage. Avoid over packing, although it will be tempting if you don’t have enough containers. Again, breathability is key and cramming stuff into boxes will make it more difficult for air to circulate while also crushing the fibres of your clothes. Delicate fabrics such as silk and organza should be stored in 100% cotton bags for breathability before placing them in the plastic bins. The finer the fabric the more protection it requires. You can also wrap them in acid-free tissue paper. For really expensive fine clothing, you might want to speak to your dry cleaner to see what they recommend. Silica Gel Packets are “desiccants” used by manufacturers to avoid moisture from building up during the shipping process. They are the little packs you find in many boxed consumer goods such as shoes. They contain little gel beads that help reduce humidity and will help protect your clothes for the few months they are in the storage unit. You can buy them online or often at Canadian Tire. Label all of your containers to make it easier to find everything. What if you have an opportunity to take a vacation to sunny climes? You’ll want to be able to find your summer clothes easily. It will also help if you have more than just clothes stored in your storage unit. Make sure you rent a climate-controlled unit to avoid damage to your clothes. This will stop humidity and in turn reduce moisture. Moisture will cause severe damage including mould and mildew as well as a musty odour you won’t be able to wash out. Avoid placing your boxes directly on the floor as the cement tends to be cool. Instead, use wooden pallets that will provide air circulation to keep moisture at bay. If you can, purchase or rent a rolling clothing rack for your storage unit. This is an excellent option, especially if it has a shelf on the bottom. The shelf keeps your bins off the floor, so you won’t need a pallet. You can place your most precious items in garment bags and hang them to avoid having to re-launder and re-iron them in the spring. If you do use a rolling clothing rack, be certain to use the right hangers. Poor quality wire hangers that you get from the dry cleaners will not be suited for long-term storage. They can add unsightly points to stretchy fabrics. Instead choose broad, thick plastic hangers to help your clothes retain their shape. Having a storage unit for your fall and summer clothes provides you with more space at home. 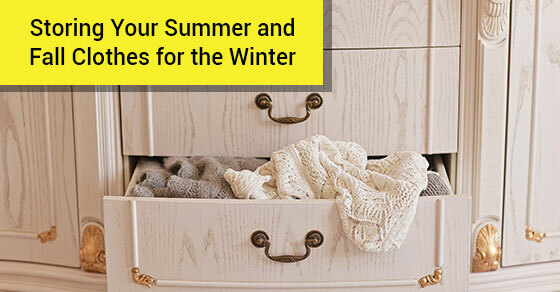 You will avoid the mess of spreading your seasonal clothes all over the house and instead keep everything safely packed out of the way until you need it when the warm weather finally arrives. For more information about storing your seasonal clothes and equipment, call Jiffy Self-Storage at 416-745-4339 or contact us here.